After seeing so many nice images, I really wanted to get some experience in combining a classical forward renderer and a ray tracer myself. Suffering from the not-invented-here syndrome, I ended up in creating my own hybrid rendering engine using WebGL1. 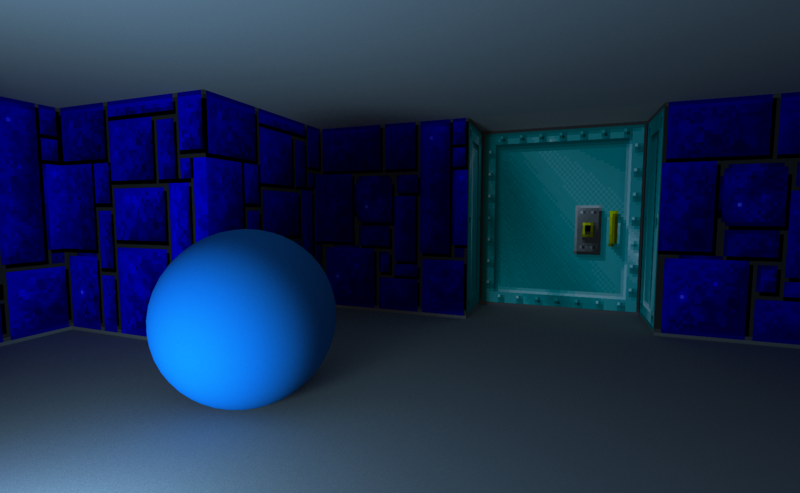 You can try out this demo rendering a Wolfenstein 3D level with some spheres (because of ray tracing) here: https://reindernijhoff.net/wolfrt. I started this project by creating a prototype trying to recreate the Ray Traced Global Illumination of Metro Exodus. The prototype is based on a forward renderer that draws all the geometry in the scene. The shader used to rasterize the geometry not only calculates direct lighting but also casts random rays from the surface of the rendered geometry to collect the indirect light reflection due to non-shiny surfaces (Diffuse GI) using a ray tracer. 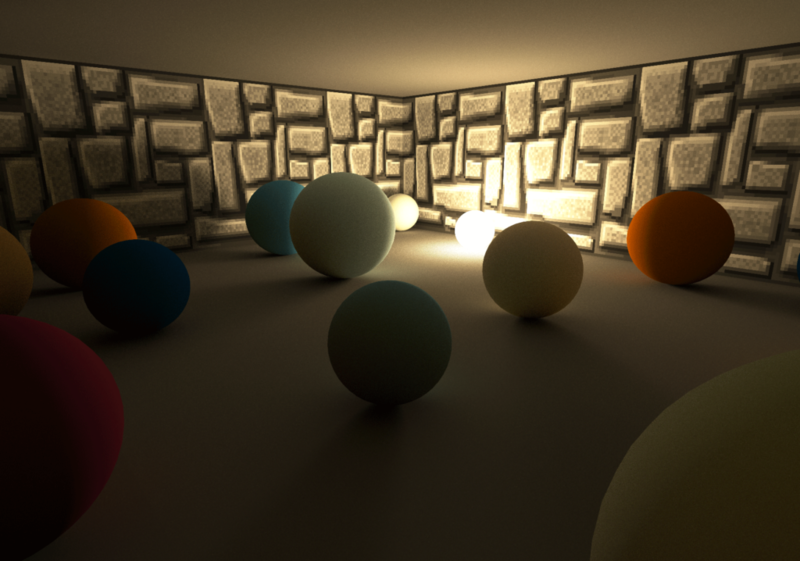 On the image to the right, you can see how all spheres are correctly lit by indirect lighting only (the light rays bounce on a wall behind the camera). The light source itself is occluded by the brown wall on the left of the image. The prototype uses a very simple scene. 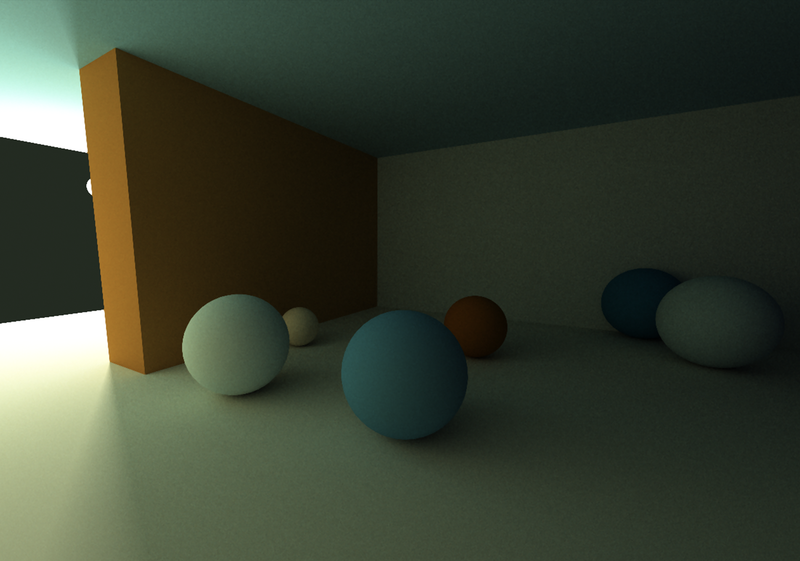 There is only one single light and just a few spheres and cubes are rendered. This makes the ray tracing code in the shader straightforward. A brute force intersection loop where the ray is tested with all cubes and spheres in the scene is still fast enough to get a program that runs fine in real-time. After creating the prototype, I wanted to make something more complex by having more geometry and by adding a lot of lights to the scene. The problem of having a more complex environment is that I still had to be able to ray trace the scene in real-time. Normally a bounding volume hierarchy (BVH) would be used as an acceleration structure to speed up the ray trace process, but my decision to make this project in WebGL1 didn’t help here: in WebGL1 it is not possible to upload 16-bit data to a texture and you cannot use binary operations in a shader. This makes it hard to pre-calculate and use BVH’s in WebGL1 shaders. That is why I decided to use a Wolfenstein 3D level for this demo. In 2013, I already created a single WebGL fragment shader on Shadertoy that not only renders a Wolfenstein-like level but also procedurally creates all textures needed. From this experience, I knew that the grid-based level design of Wolfenstein could also be used as a fast and simple acceleration structure and that ray tracing through this structure would be very fast. You can play the demo in the iframe below, or play it full-screen here: https://reindernijhoff.net/wolfrt. The demo uses a hybrid rendering engine. It uses traditional rasterization technologies to render all the polygons in a frame and then combines the result with ray traced shadows, diffuse GI and reflections. The maps in Wolfenstein can be fully encoded in a 2D 64×64 grid. The map used in the demo is based on the first level of episode 1 of Wolfenstein 3D. At startup, all geometry needed for the forward pass is created. A mesh for the walls is generated based on the map. A plane for the ground and ceiling is created as well as separate meshes for the lights, doors and the randomly placed spheres. All the textures used for the walls and doors are packed in a single texture-atlas, so all walls can be drawn using a single draw call. Direct lighting is calculated in the shader used for the forward rendering pass. Each fragment can be lit by (at most) four different lights. To know which lights could affect a fragment in the shader, a look-up texture is pre-calculated at startup. This look-up texture is 64 by 128 and encodes the 4 nearest visible light positions for every position in the grid of the map. To get soft shadows, for each fragment, for each light, a random position in the light is sampled. Using the ray trace code available in the shader (see below: Ray tracing), a shadow ray is cast to the sample point in order to determine the visibility of the light. Eventually, after adding (optional) reflections (see below: Reflection), diffuse GI is added to the calculated fragment color by doing a lookup in the Diffuse GI Render Target (see below). Whereas in the prototype the ray trace code for the diffuse GI was combined with the forward shader, I decided to decouple both in the final demo. The decoupling is done by drawing all geometry a second time to a separate render target (the Diffuse GI Render Target), using a different shader that only casts the random rays to collect the diffuse GI (see below: Diffuse GI). The collected light in this render target is added to the calculated direct lighting in the forward render pass. By decoupling both the forward pass and the diffuse GI, it is possible to cast less than one diffuse GI ray per screen pixel. You can do this by decreasing the Buffer Scale (adjust the slider in the controls at the top right of the screen). If, for example, the Buffer Scale is .5, only one ray for every four screen pixels will be cast. This gives a huge performance boost. Using the same UI in the top right of the screen, you can also change the samples per pixel of the render target (SPP) and the number of bounces of the ray. * In the red channel of the texture, all objects at the corresponding x,y cell in the grid of the map are encoded. If the red channel is zero, no object exists in the cell, otherwise, a wall (values 1 to 64), a door, a light or a sphere occupies the cell and should be tested for intersection. * If a sphere occupies the cell in the grid of the level, the green, blue and alpha channels are used to encode the radius and the relative x and y position of the sphere inside the grid cell. Similar ray trace code through a grid can be found in this Wolfenstein shader on Shadertoy. After calculating the intersection point with a wall or a door (using a box intersection test), a lookup in the same texture-atlas as used in the forward pass gives the albedo of the intersection point. The spheres have a color that is procedurally determined based on their x,y position in the grid and a color gradient function. Doors are a bit problematic because they can move. 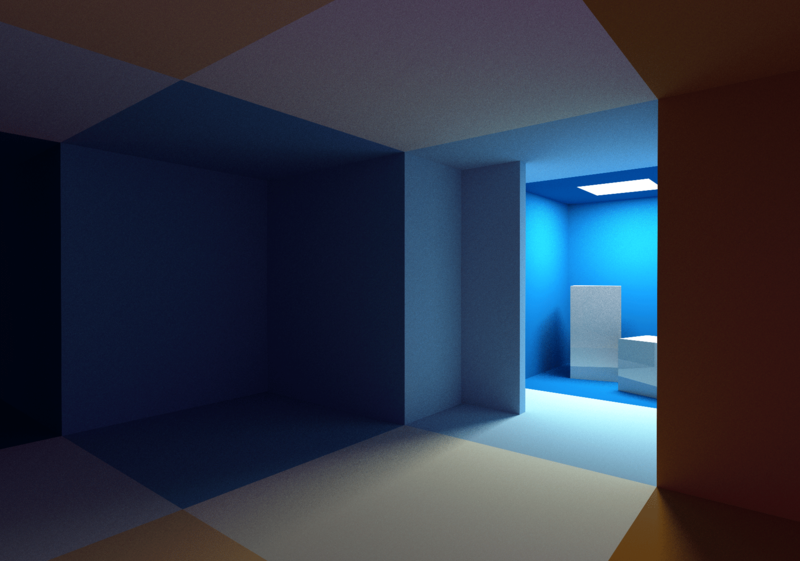 To make sure that the scene representation on the CPU (used to render the meshes in the forward pass) is the same as the scene representation on the GPU (used for the ray tracing), all doors are moved automatically and deterministically based on the distance between the camera and the door. [IMG]Debug colors enabled. Can you find the secret exit? The diffuse GI is calculated by casting rays in a shader that is used to draw all geometry to the Diffuse GI Render Target. The direction of these rays is based on the normal of the surface using cosine weighted hemisphere sampling. To reduce noise, direct light sampling is added to the loop. This is similar to the technique used in my shader Yet another Cornell Box on Shadertoy. Reflections are added in the forward rendering pass, consequently, always one reflection ray per screen pixel will be cast. As only ~1 sample per pixel is used for both the soft shadows in the forward rendering pass and the approximation of the diffuse GI, the end result is extremely noisy. To reduce noise, temporal anti-aliasing (TAA) is implemented following Playdead’s TAA implementation: Temporal Reprojection Anti-Aliasing in INSIDE. The main idea behind TAA is quite simple: TAA computes a single subpixel per frame and then averages its value with the correlated pixel of the previous frame. To know where the current pixel was located in the previous frame, the position of the fragment is reprojected using the model-view-projection matrix of the previous frame. I also tried to use a bounding-box-based clamp method, but I didn’t see a lot of difference with the current approach. This is probably because the scene in the demo has a lot of similar, dark colors and there are almost no moving objects. Noise is the basis of the algorithms used to calculate diffuse GI and soft shadows. Using good noise will have a big impact on image quality, whereas using bad noise will give artefacts or slow converging images. I’m afraid that the white noise used in this demo is not very good. Probably, using good noise is the most important thing to improve the image quality of this demo. For example, by using blue noise. Even with the TAA enabled, there is still a lot of noise visible in this demo. Especially the ceiling is hard to render because it is lit by indirect lighting only. The fact that the ceiling is a large flat surface with a solid color doesn’t help either: if it would have a texture or geometric details the noise would be less visible. I didn’t want to spend a lot of time on this part of my demo, so I only tried one noise reduction filter: a Median3x3 filter by Morgan McGuire and Kyle Whitson. Unfortunately, this filter didn’t work well with the “pixel-art” graphics of the wall textures: it removed all detail in the distance and rounded the corners of nearby wall pixels. In another experiment, I used the same filter on the Diffuse GI Render Target. Although this did reduce the noise a bit and kept the texture detail of the wall intact, I decided that the improvement was not good enough to justify the extra ms spent. You can try out the demo here: https://reindernijhoff.net/wolfrt.